February is adopt a black shelter pet month. I would like you to meet my friend, Sasha. Sweet Sasha has been with us a couple years. 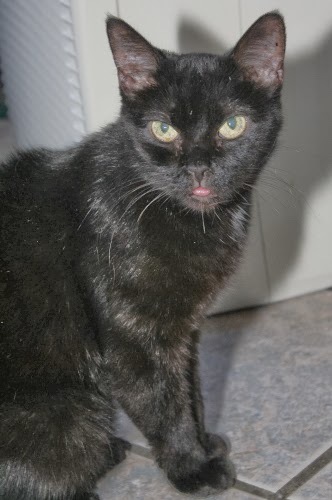 She is solid black with just a tinge of white on her chest and she is a senior kitty, if you call 9-10 yrs old a senior. Since cats live well in to their 20's. I call her a middle age lady. She is out of her kitten and teenager years and is enjoying her middle ages now. She would love to be in a home to enjoy the rest of her years in. Her biggest wish is to be in a warm home where she can sun in the windows without other kitties pushing her out of the way. Maybe a nice lap to curl up in and watch tv. She gets along with other kitties ,she has 15 roommates at the humane society. If you can't adopt Sasha then please show her some love and support by sharing this post. You never know who may be searching for a kitty just like her. Meow, meet Sasha!! Sasha loves to be rubbed, she just purrs and purrs. If you are looking for a cat that you can sit back and relax with, Sasha is your cat. She is loving and so sweet! Sasha is a healthy adult cat around 9-10 years old. Sasha is spayed, up to date on shots, and is FIV/FeLV negative. Email for quick reply- Email Us Please tell them you seen her on my site. Sasha, I hope you find your forever home. You look beautiful in black. Aww! Hope Sasha finds a home soon!! I adopted Mr. K, a black Scottie, from a shelter...but it was during the month of April no February. That still counts, right? ;) Much love, The Scottie Mom. Sasha is so lovely! Sharing. Sasha is beautiful. Sure hope she finds a home. Will share.